The cost of a personal porter is A$790.00 which covers the porter's wages, food, relocation back to village and road transport. We invite you to walk with us along this 97 klm most beautiful rugged track, let us share with you the emotional stories of our brave young diggers. Get to meet all our kind, generous Papua New Guinean friends who live along the trail and have an adventure of a life time. 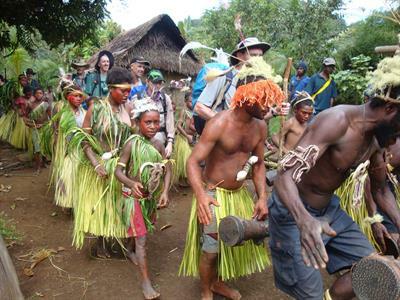 It is important to PNG Trekking that our trekkers not only get to experience the W11 History along our PNG tracks but to also immerse themselves in the culture. This trek is designed to combine both experiences. It is important that all the people from Dumpu through to Madang benefit from eco tourism. This is why we choose to take this route. We feel that trekkers that come to Papua New Guinea need to understand the culture thus in turn understanding the climate that our soldiers were fighting in. The World War 11 History: The 1942-43 defeats of the Japanese at, Kokoda, Milne Bay, around Buna and at Wau opened the way for the Allies to plan and mount the advance on the major objective of Lae, New Guinea. This large Japanese base sat on the coast near the mouth of the Markham River at the southern end of the Huon Peninsula. By capturing this area, the Allies would be able to develop airfields in the Markham Valley to support subsequent advances along the north coast. In May 1943, General Douglas MacArthur, Commander-in-Chief of the Allied forces in the South-West Pacific Area, issued a directive for the attack on Lae. Australian forces were to capture Lae, and then continue with two advances at the same time, one around the coast of the Huon Peninsula and the other inland following the Markham and Ramu Valleys. The latter would culminate with the capture of one of the key features, Shaggy Ridge. Walk the track and learn more. 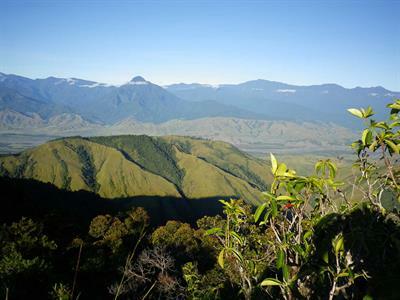 Shaggy Ridge, New Guinea. December 27, 1943. Troops of the 2/16th Australian Infantry Battalion, watch aircraft bombarding The Pimple prior to their attack on Japanese positions. The personnel pictured include: Pte J. B. Knight, Pte O.J. Mortimer, Pte W. Rees, Pte W. E. Brandis, Pte E. J. Gooding, Capt. V. E. C. Anderson, Lt J. Lee, Sgt E. S. Holland. The 1942-43 defeats of the Japanese at, Kokoda, Milne Bay, around Buna and at Wau opened the way for the Allies to plan and mount the advance on the major objective of Lae, New Guinea. This large Japanese base sat on the coast near the mouth of the Markham River at the southern end of the Huon Peninsula. By capturing this area, the Allies would be able to develop airfields in the Markham Valley to support subsequent advances along the north coast. In May 1943, General Douglas MacArthur, Commander-in-Chief of the Allied forces in the South-West Pacific Area, issued a directive for the attack on Lae. Australian forces were to capture Lae, and then continue with two advances at the same time, one around the coast of the Huon Peninsula and the other inland following the Markham and Ramu Valleys. The latter would culminate with the capture of one of the key features, Shaggy Ridge. Ahead of the land attack Allied bombers mounted a strong campaign against the Japanese base and lines of communication, weakening the defences. The first action by Allied troops was a paratroop drop, the first in New Guinea, on 5 September 1943. The American 503rd Parachute Infantry Regiment, and some gunners of the Australian 2/4th Field Regiment, were dropped over the Markham Valley, and seized an abandoned airfield at Nadzab. Work quickly commenced to prepare the airstrip for transport aircraft to land more troops. Australians of the 7th Division were to be flown by American transport planes from Port Moresby to another airfield at Tsili Tsili and then march into the Markham Valley. However, tragedy struck on 7 September 1943 when a bomber taking off from Port Moresby crashed into men of the 2/33rd Battalion's D Company, who were waiting to board aircraft for the flight to Tsili Tsili. The 11-man American crew and 60 Australian troops were killed, and a further 92 Australians were injured; more died later from their burns and injuries. The shocked survivors were flown to the front. I wanted to bring [wounded] Cpl Richards back, because he was my cobber, so I jumped out from the stump where I was sheltering and threw a few grenades over into the position where the Japanese were dug in. I did not kill them all, so went back, got a Bren gun and emptied the magazine in the post. That settled the Japanese. Another option opened up when I went on to get Cpl Richards, but we got a bit of covering fire and I brought him back to our lines. Kelliher was awarded the Victoria Cross, the highest honor in the British Empire. 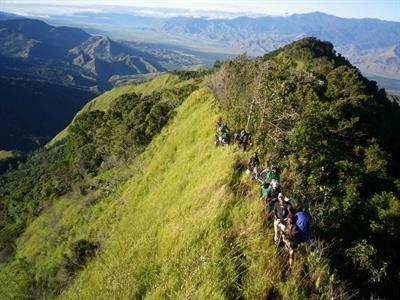 Shaggy Ridge, New Guinea. 1944-01-23. Troops of "C" company, 2/9th infantry battalion digging into a newly occupied feature on Shaggy Ridge. The 7th Division pressed on. Meanwhile, the 9th Division sailed towards the forward area, and landed on the coast north of Lae. 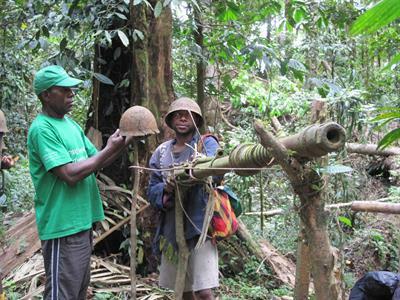 The two divisions were then in a race to claim the honor of capturing Lae. It was almost too close to call. Men from both divisions were entering the shattered base from opposite ends when they linked up on 16 September 1943. Most of the Japanese garrison had escaped into the mountains, beginning what for many was a 'death march', as with little food and few medical supplies they struggled to reach the northern side of the Finisterre Range. We could see [the Japanese] now and opened fire on their heads as they bobbed up above their foxholes … Somebody gave a shrill blood-curdling yell that startled even us, and was partly responsible for some of the enemy running headlong down the ridge in panic. Unable to stop at the edge of the cliff, they plunged to their doom hundreds of feet below. Flying up a valley close to treetops was extremely dangerous because it was very difficult to judge the incline, [which was] often greater than the aircraft's maximum rate of climb, so that even with full throttle the plane could not climb out of the valley. Furthermore if the valley sides were … narrowing sharply, it was very easy to misjudge the point where there was enough turning space left. … There were many times when I thought I had misjudged it and came out with heart pounding. It took weeks of successive attacks on the Japanese to take Shaggy Ridge. The battalions of the 21st Brigade who had borne most of the fighting, were relieved for a rest and, in late January 1944, the ridge finally fell to men of the 18th Brigade. The Australians pushed on, gradually making their way down towards the coast to link up with troops fighting their way around the Huon Peninsula's coastline. The 15th Infantry Brigade took over the campaign, pushing on to link up with troops who advanced inland on the Huon Peninsula. By the start of February 1944, the last objectives in this area were taken. It was then left to troops of the 8th and 15th Brigades to push on along the coast. Arrangements have been made to transfer your clean clothes and any other items you may need from Lae to Madang whilst the group is on the track. 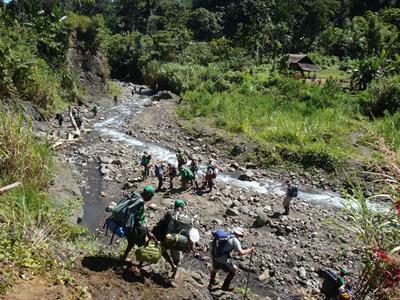 Please put items that you are not taking on the trek and want transferred to Madang in a separate locked bag. •	Mosquito Net (please tie a long piece of string to the tabs so you can tie the net up). You will find our food packs are great. There is plenty of food. Only bring extra food if there are special dietary requirements. Dietary requirements please discuss with us. On arrival at Port Moresby International Airport trekkers will be met by PNG Trekking Adventures representatives and transferred to the domestic terminal to book onto domestic flights. We will then take trekkers to the PNG Trekking offices where a equipment check and briefing of what will be happening over the next 8 days. On arrival at Nadzab airport transfer to Lae Hotel taking approximately 45 minutes. Hotel Accommodation. Today the group will be transferred to Madang Domestic airport to connect with flight to Port Moresby for their onward journey home. Bookings of 8 or more before trek will proceed. Prices are per person. Please select the number of people available on the next page after selecting a date and clicking Book Now! We invite you to walk with us along this 97 klm most beautiful rugged track, let us share with you the emotional stories of our brave young diggers. Get to meet all our kind, generous Papua New Guinean friends who live along the trail and have an adventure of a life time.